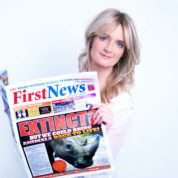 Nicky Cox is founder and editor-in-chief of First News, the national newspaper for young people with more than two million readers a week, and of First News Live!, the world’s first online news channel for children. Nearly half of schools subscribe to First News, making it the widest-read publication for children in the UK. Nicky was made an MBE for services to children in the Queen’s Birthday Honours 2009 and, in 2013, was given a Patron’s award from the NSPCC and ChildLine for dedication to children. She is passionate about giving kids a voice and a fair deal. First News is picking up a string of awards. In the annual industry Newspaper Awards, it has picked up the gongs for Weekly National Newspaper of the Year and Niche Newspaper of the Year. It was also made National Newspaper of the Year by the Plain English Awards and Save The Children gave the newspaper an award for outstanding contribution to children. In 2014, Nicky was one of the Women of Achievement in the Women of the Year Awards. Her passion and mission in life is to give children a voice, to include them in the global conversation, and to help them to become active and engaged citizens of the world. She says that the world will only become a better place if the next generation is better informed than the last. In a previous life Nicky was editorial director of the children’s division at BBC Worldwide (for 14 years) and a sub editor at The Sunday Times. At the centre of her life are her four gorgeous and talented kids – Barney, 22, Beth, 20, Daisy, 18 and Liberty, 15.